I recently had a short block of creative time -don’t you love it when that happens?- and decided it was time to just dig in a try playing around with some basics, skill builders if you will. I love all the design possibilities there are with half square triangles, but have not done much with them so far. As many of you know, I’m pretty much an improv gal and don’t have a ton of patience for repeating the same block over and over, but why put yourself in a box right? I’m feeling like a little chevron design is in my quilting future. It’s been fun playing with colors, layout, etc. 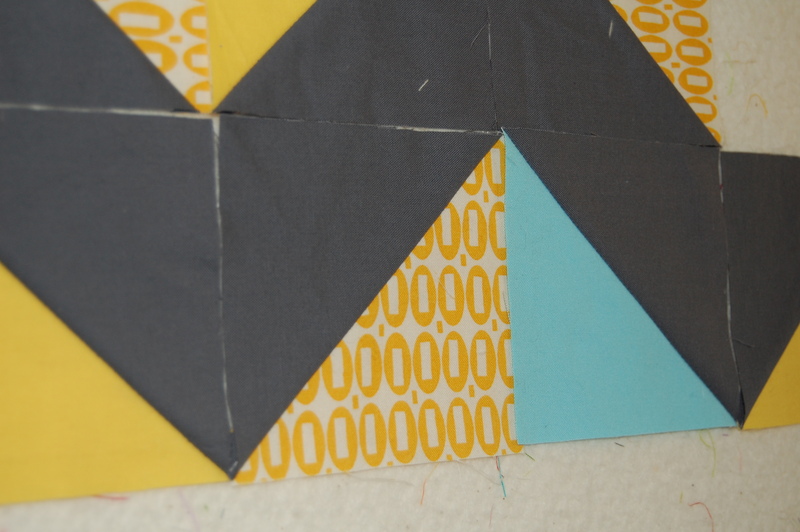 I love the look of the chevron design, I’m just not sure I’m up for creating that many HSTs. It’s okay though, I have a possible solution I’m working on. I’ll keep you posted!! I’m linking up with Frontier Dreams- Keep Calm and Craft On. If you have a bit of time, go on over and check out all the sweet, craftiness that abounds over there. Hope you enjoy a lovely week! Karen, I’ve been wanting to play with HSTs too. 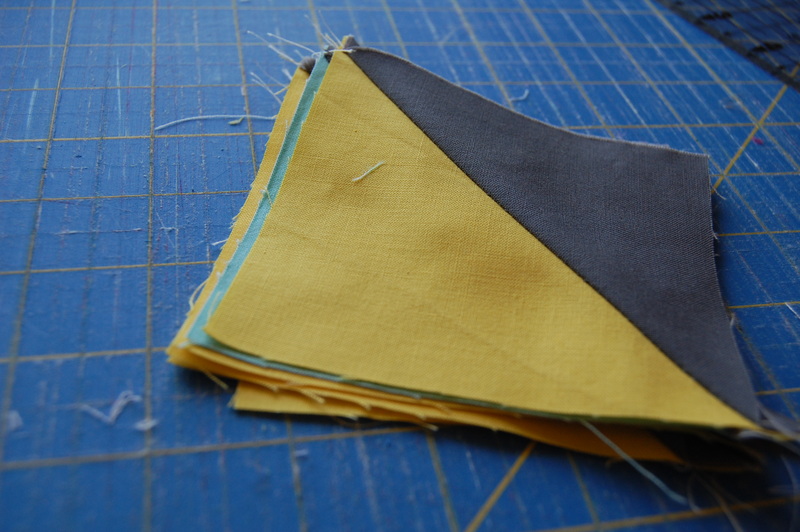 There is a method where you cut large squares and from 2 squares you get 4 HSTs – but you end up with bias edges on the outside of each of them. 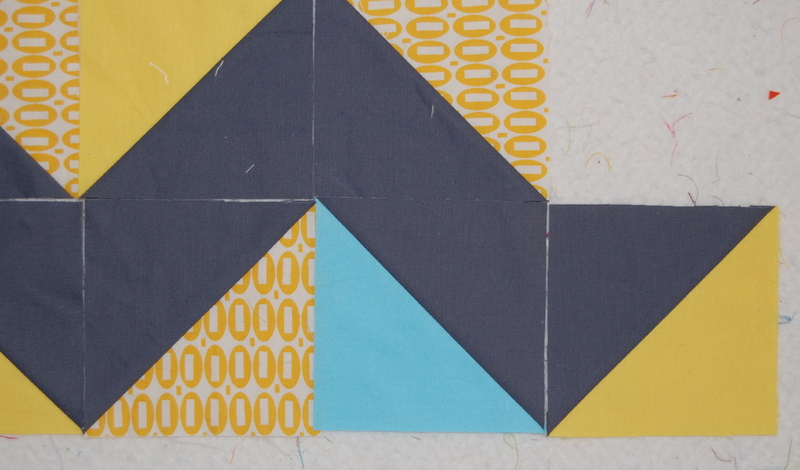 There is another method where you take two large squares and end up with EIGHT HSTs – no bias edges. It also teaches you how to do the math to know what size squares to start with if you want your finished HSTs to be a specific size…. I don’t have the tutorial at my fingertips, but if you google something like 8 HSTs from 2 squares of fabric you should find it. And if you try it, please let us know what you think. Obviously it doesn’t work if you have a totally scrappy quilt in mind, but if you can use at least 8 identical HSTs it sounds like a dream. I love the colors. It’s gonna be a beauty! Hi, Liz. Is your background color Kona coal? Because I just made a bunch of HST’s that I sewed and trimmed and no longer want, with coal as the background color and yellows that match yours (including the pezzy print!). Take a look at my blog post about them and let me know if you’d like me to send you any –I’m happy to do so! Better someone uses them than they lie dormant in my stash. Love that you had soem time to devote to that! I love the chevron you are working on the the colours are fantastic!